I have often pointed out that patents are a natural right under Locke’s theory of property rights. Locke stated, in modern language, that you own yourself so you have the right to those things you create. Many detractors have suggested that this absurd. 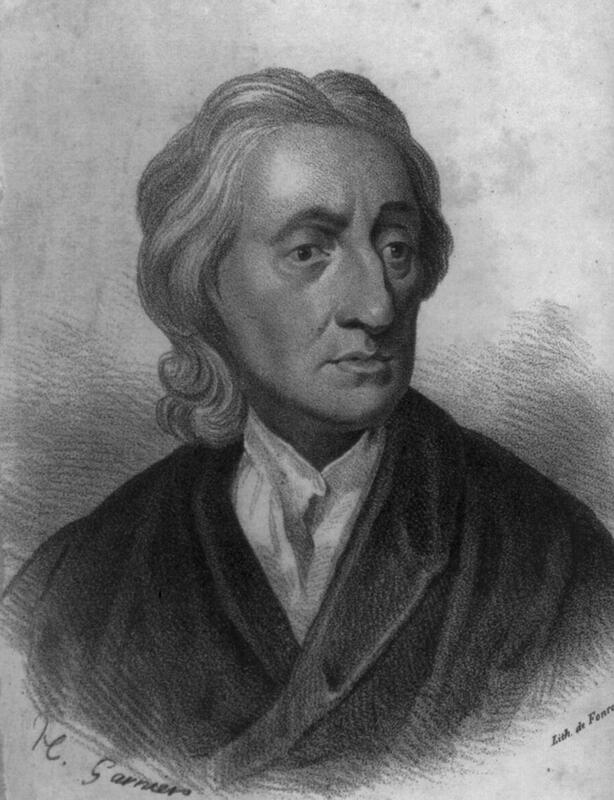 According to Locke the three chief natural rights are life, liberty, and property. Locke states that protecting property rights is the main reason for forming governments. Sec. 124. The great and chief end, therefore, of men’s uniting into commonwealths, and putting themselves under government, is the preservation of their property. Inventions are the result the inventor’s labor and therefore property under Locke. Property is a natural right, so patents are natural rights. Despite this logical connection, many people have continued to deny that patents (property rights in inventions) are a natural right. Locke’s ideas were incorporated in the law of the United States by William Blackstone’s Commentaries on the Laws of England. This treatise became the basis of common law in the US. Here is what Blackstone said about patents and copyrights (intellectual property). Note that he cites Locke’s ideas on property rights for his explanation for why intellectual property is Property. There is still another species of property, which (if it subsists by the common law) being grounded on labour and invention is more properly reducible to the head of occupancy than any other; since the right of occupancy itself is supposed by Mr. Locke, and many others, to be founded on the personal labour of the occupant. And this is the right, which an author may be supposed to have in his own original literary compositions; so that no other person without his leave may publish or make profit of the copies. When a man by the exertion of his rational powers has produced an original work, he seems to have clearly a right to dispose of that identical work as he pleases, and any attempt to vary the disposition he has made of it, appears to be an invasion of that right. Now the identity of a literary composition consists entirely in the sentiment and the language: the same conceptions, clothed in the same words, must necessarily be the same composition: and whatever method be taken of exhibiting that composition to the ear or the eye of another, by recital, by writing, or by printing, in any number of copies, or at any period of time, it is always the identical work of the author which is so exhibited; and no other man (it hath been thought) can have a right to exhibit it, especially for profit, without the author’s consent. This consent may perhaps be tacitly given to all mankind, when, an author suffers his work to be published by another hand, without any claim or reserve of right, and without stamping on it any marks of ownership; it being then a present to the public, like building a church or bridge, or laying out a new highway: but, in case the author sells a single book, or totally grants the copyright, it hath been supposed, in the one case, that the buyer hath no more right to multiply copies of that book for sale, than he hath to imitate for the like purpose the ticket which is bought for admission to an opera or a concert, and that, in the other, the whole property, with all it’s exclusive rights, is perpetually transferred to the grantee. On the other hand it is urged, that though the exclusive property of the manuscript, and all which it contains, undoubtedly belongs to the author, before it is printed or published; yet from the instant of publication, the exclusive right of an author or his assigns to the sole communication of his ideas immediately vanishes and evaporates; as being a right of too subtile and unsubstantial a nature to become the subject of property at the common law, and only capable of being guarded by positive statutes and special provisions of the magistrate. The Roman law adjudged, that if one man wrote any thing on the paper or parchment of another, the writing should belong to the owner of the blank materials meaning thereby the mechanical operation of writing, for which it directed the scribe to receive a satisfaction; for in works of genius and invention, as in painting on another man’s canvas, the same law gave the canvas to the painter. As to any other property in the works of the understanding, the law is silent; though the sale of literary copies, for the purposes of recital or multiplication, is certainly as antient as the times of Terence, Martial, and Statius. Neither with us in England hath there been (till very lately) any final determination upon the right of authors at the common law. The idea that patents are a natural right is incorporated in early American law as the quote below shows. It is just obstinance or disingenuousness to suggest that patents are not part of natural rights. The Second Treatise of Civil Government; 1690; John Locke; CHAP. IX., Of the Ends of Political Society and Government. This blog is focuses on economics, invention, and the law from a Natural Rights and Objectivist point of view.